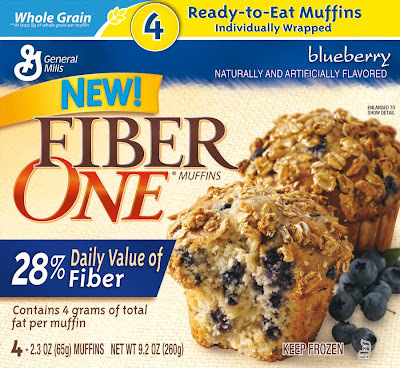 We were contacted by a Fiber One Rep and was sent a box of Blueberry Fiber One Frozen Muffins for review. They arrived in a foam container with ice packs and still very cold. The muffins are a regular size muffin and taste great! They even smell more wonderful warm from the microwave! I enjoyed the oat topping they have on the tops too. I gave the kids each one for an after school snack and they all loved them! I would recomend these muffins, and think it's great they are ready to go straight from the freezer as a quick snack that's good for you. Fiber One™ Frozen Ready-to-Eat Muffins come individually wrapped for a convenient and nutritious breakfast or snack on the go. Enjoy the muffins straight from the refrigerator or heat in the microwave for a warm delight. Look for Fiber One™ Muffins in grocers’ freezer sections. PREPARATION: Heat in microwave for 10 to 15 seconds. STORAGE: Keep in refrigerator until ready to eat. For longer storage, keep frozen. For more information about Fiber One, to shop online, or get a money saving coupon, please check out their site here. THREE "Mommy? I'm Hungry!" 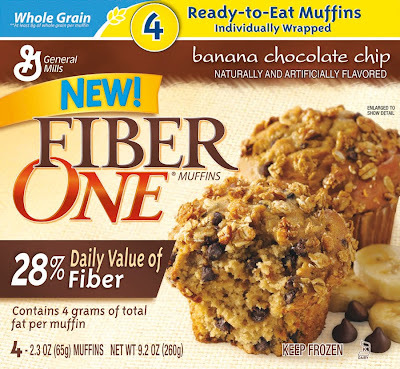 readers will receive ONE coupon for a FREE box of Fiber One Frozen Muffins ($4.53 value). 1. All you have to do is tell me which flavor you would pick! Earn up to 6 bonus extra entries by showing some "Mommy? I'm Hungry!" bloggie ♥ with these rules*! This Giveaway ends: 11:59 pm pst, Tuesday, February 9, 2010. I wrote this review for "Mommy? I'm Hungry!" about Blueberry Fiber One Frozen Muffins. I received free product to review and keep as compensation for my honest opinion of the product as well as coupons for a giveaway. Info and some images provided by PR. All opinions for this review are that of myself & family. I would do blueberry. I love all fiberone products but havnt tried or seen the muffins. I would pick Blueberry :) *Thanks* for the giveaway! I now follow on twitter (@caotto7446). banana chocolate chip for me! I hadn't heard of them before. Thanks. I would try the blueberry. Banana chocolate chip for the win! I love Blueberry Muffins and thats what I would choose!! Yum!! Blueberry! Thanks so much for the giveaway! Blueberry sounds good to me! i love blueberry muffins, so probably that flavor! Mmmmm, blueberry for sure. I love their bars! Great for breakfast on the go. I havent seen the muffins yet, but then again I havent really looked. I would pick the banana chocolate chip! I haven't seen these at my grocery store but then again I wasn't looking for them. I will now! The Blueberry would definitely be my favorite! I would pick the blueberry! banana chocolate chip is what i'd pick--yum! I would pick the blueberry. yum!! Blueberry would be my choice. Thanks for the wonderful giveaway. I would love to try the blueberry muffins. What stores have you found the muffins at? I have been looking and can't find them anywhere! I have seen them both at Albertson's & Ralph's grocery stores, in the freezer case next to the waffles and such. 67 What stores have you found the muffins at? I have been looking and can't find them anywhere!